JANUARY 6, 2016 – Newport, RI – Charlie Enright and Mark Towill announced today the formation of their new racing team, 55 South. Enright and Towill will train and race under 55 South as they work toward their ultimate goal of returning to the Volvo Ocean Race in 2017-18. In addition, Enright and Towill announced their title sponsor for 2016, sustainability organization, 11th Hour Racing based in Newport, Rhode Island. The newly formed team will compete in 2016 as 55 South – 11th Hour Racing and aim to set the example for a more responsible relationship with energy and water resources in the sport of sailing. 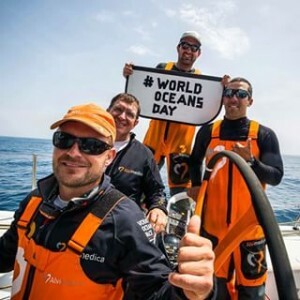 Bristol, Rhode Island native, Enright and Kaneohe, Hawaii, native Towill were founders of the 2014-15 Volvo Ocean Race entry, Team Alvimedica. In 2015, the team was the first to round Cape Horn and as the southern most point in any around the world race, it is considered to be a pinnacle of achievement. Recognizing the amount of work it took to get the team to Cape Horn, Enright and Towill committed to returning in the 2017-18 edition of the Volvo Ocean Race and thus formed 55 South. Co-Founder/Principle, Mark Towill, “Both Charlie and I are excited to be back on the water racing with our own team again. I’m also extremely happy to be working with 11th Hour Racing to help raise the awareness for ocean health. We are looking forward to promoting sustainability solutions at the events we race in and to the wider sailing community. And of course, I’m always looking towards our ultimate goal of returning to 55 South. The 2016 race campaign for 55 South-11th Hour Racing is currently scheduled to include the M32 Bermuda Series along with speaking engagements promoting ocean health and environmental sustainability. The first race will be January 8-10.